The very peaceful location of this immaculate home is undeniably one of its trumps! No . . .
House for romantic souls to falling in love with at first sight! First of all because of its . . .
Want to live close to Bordeaux but can't find what you are looking for? Here you have a . . . STUNNING SPACIOUS HOUSE on 3ha with equestrian facilities, secured pool and separate barn! ENTRE-DEUX-MERS REGION, at 45 min of BORDEAUX! Really charming stone house with bags of authenticity, offering you a huge kitchen, spacious . . .
ONLY 30 MIN FROM BORDEAUX with good acces! Charming well renovated GIRONDINE house amidst vines with beautiful views, close to amenities! Au Calme! PRICE REDUCTION 570 000 € ! Settled on a dominant position, overlooking vines and some . . . This century old property has kept a lot of its authenticity, however has been completely . . .
Fabulous grand stone family house situated in a quiet village with large garden super . . .
LOVE AT FIRST SIGHT for this century old character house! Located in a quiet romantic country . . . 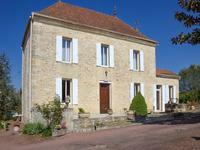 In a quiet hamlet in the Entre Deux Mers region known for its rolling countryside, . . .